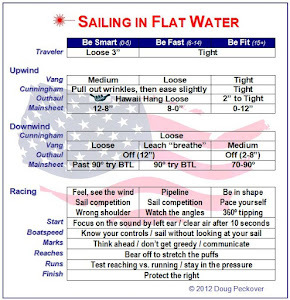 A good regatta strategy is sailing consistently to preserve your drop race as long as possible. In this way, you can use it for tactical reasons later on in the regatta. This certainly was not what happened at the 2013 Canadian Master Championships when I got a 29 in my first race (hate those 90 degree persistent shifts!) This appalling start really limited my strategy for the rest of the regatta. A better example was the recent Rock the Ice event. After the first day I was in first place with 10 points and a 2 as my drop. My main competition had 15 points with a 4 as his drop, so a real difference of 3 points. 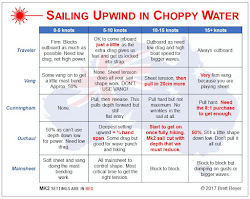 The next day would be light and Griffin is a great sailor with several advantages – sailing regularly on this lake, being 20 pounds lighter, and having the Mk II sail which I’m convinced is faster in these conditions. In fact, at times he had much better upwind speed. If we finished in that order, my lead would be just 2 points with 2 more races to go, and this finish would equal my drop. But if anyone behind passed me, then a 3 or worse would mean that this would have to be my drop. The only way for this to not be a drop was by beating Griffin which would increase my lead to 4, but this seemed unlikely in these conditions. It looked like this race would be my drop, so I decided to make the most of it. I covered Griffin going downwind, he defended, we sailed off to the left, and we lost many places. We played games on the next beat and final run, and Griffin finished with a 4 to my 6. He had to count his score while I was able to drop mine, so instead of my lead being reduced to 2, it was increased to 5 - a nice cushion. This made the rest of the event easier so I could sail my own race. Note to self: play it safe (one way described here), preserve your drop race, and use it in the second half when needed. When Doug wrote this post, I immediately asked about those of us who don't have the luxury of managing drop races because our scores aren't that hot. 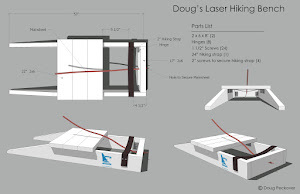 So, Doug is at the Florida Laser Masters' Midweek Madness event. Today he has a 4, 28, and 8 in a 48 boat fleet. I couldn't help but say 'welcome to my world, now what?' He told me to just drop it. Will be interesting to see what tomorrow brings. Why have drop races at all? I guess drop races were originally introduced because equipment failures were frequent. This not much of a problem now. A high score is viewed as bad luck, but a few places lost by luck in every race is seen as poor sailing. Why rank one large bad luck any higher than multiple small events? My observation is that drop races help gamblers and lead to many more general recalls. Several keelboat classes (Farr 40 , TP52) don't have discards. Often regattas have many races, which spreads bad luck events around the fleet anyway. Olympic 100m and more doesn't allow a discard race! Mike, I agree 100%. I'm writing about how to best use the sailing rules, but I don't like this one because it penalizes consistency. If organizers were to have every race count, we'd have less general recalls and more clean, fair racing.